The trade winds seem to have subsided and the market sailed into the doldrums. With the news flow on a potential China-U.S. trade deal slowing to a trickle and the market apparently lacking a catalyst to move higher – or even much lower – stocks have been drifting down in recent sessions, but the selling hasn’t had much conviction behind it. European stocks were mixed overnight as investors across the pond also appeared to be awaiting news on the trade front as well as a rate decision from the European Central Bank tomorrow. In Asia, mainland Chinese stocks rose after Beijing announced stimulus measures Tuesday including infrastructure spending and tax cuts. Economies in Europe and China have shown signs of weakening, with the Asian nation on Tuesday announcing a growth target for 2019 below last year’s expansion. If China achieves this year’s target of between 6% and 6.5%—down from last year’s 6.6% growth—it would mark a new three-decade low for Chinese economic growth, which wouldn’t be a good sign for global growth as a whole. Still, not all would be lost, as many nations would be envious of a growth rate that fast. And it would still offer plenty of potential for buying goods from and making up a key part of supply chains for multinational companies. 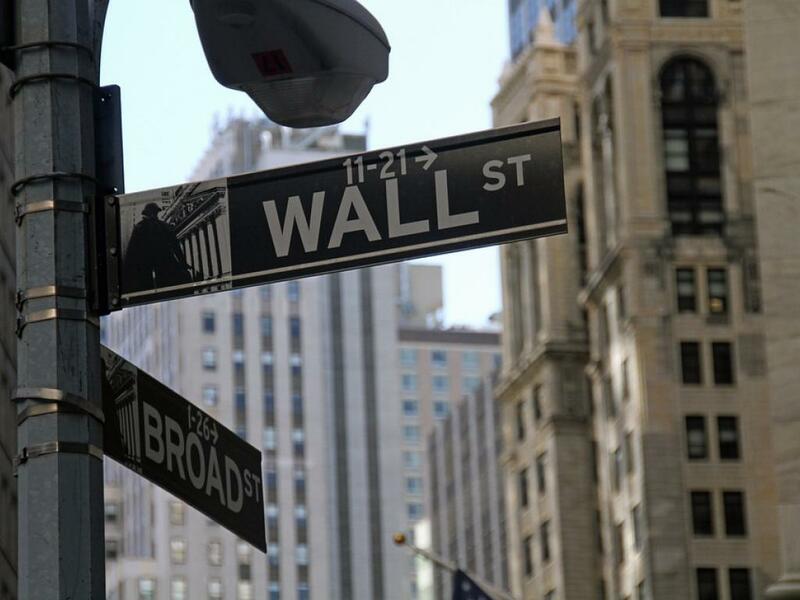 The news out of China added to a lackluster day for Wall Street on Tuesday, when the S&P 500 Index (SPX) backed farther away from the psychologically important 2800 technical level. Given that stocks are up so much this year, that level might be serving as an excuse for some profit taking. On the China-United States trade front, President Trump is pushing U.S. negotiators to get a deal done soon, hoping to boost the market, according to a Bloomberg report. But U.S. Secretary of State Mike Pompeo told Sinclair Broadcasting Group that a U.S.-China deal has to be perfect for President Trump to accept it. Still, the United States would keep working on hammering out a deal if it rejected one that wasn’t just right, he said. He also told a Des Moines, Iowa, television station that he thinks the two nations are “on the cusp” of a deal. Those comments arguably don’t change much in Wall Street’s assessment of where things stand economically between the world’s two largest economies. Optimism that the two sides can reach a deal and avert further damage to the global economy has been one major leg of support for stocks this year following deep declines late last year on worries that the trade war would crimp global growth. Industrials was the worst performing S&P 500 sector on Tuesday, led lower by a more than 4.7% drop in General Electric Company (NYSE: GE) shares. The company’s chief executive officer said that the free cash flow of its industrial division will be negative this year. Other corporate news was more positive, at least in the retail space. Target Corporation's (NYSE: TGT) shares rose nearly 4.6%, helped by news that Q4 same-store sales as well as full-year guidance exceeded analysts’ expectations. Earnings and revenue for Q4 were in line to slightly higher than analysts had expected. Meanwhile, Kohl’s Corporation (NYSE: KSS) shares closed more than 7.3% higher after the company handily beat analysts’ estimates on its top and bottom lines, and holiday same-store sales also rose faster than Wall Street had expected. In economic news, even as the Trump administration has been working toward a deal with China on tariffs to reduce a deficit, the trade deficit soared to a 10-year high in 2018 with an increase to $59.8 billion in December, according to a U.S. Commerce Department report released this morning, delayed due to the government shutdown. Economists expected closer to $57.3 billion, according to a Reuters survey. December’s deficit was a result of imports increasing 2.1% as exports declined 1.9%. Separately, U.S. private-sector job growth appeared to slow in February. ADP figures this morning showed 183,000 new jobs were added in the U.S., versus a revised 300,000 jobs in January and an expected gain of 180,000. Retail and travel saw the greatest slowdown, according to ADP. That’s the lowest number of new private sector jobs since November. Investors are scheduled to see the release of the Fed’s Beige Book this afternoon. The central bank’s pivot to a more-dovish stance this year has been the other major leg of support for the market in the first two months of 2019. Market Worry Stays Low: As you might expect on a day when stocks declined, Wall Street’s main fear gauge, the Cboe Volatility Index (VIX) was up Tuesday. But the moves in both stocks and the VIX were on the small side. 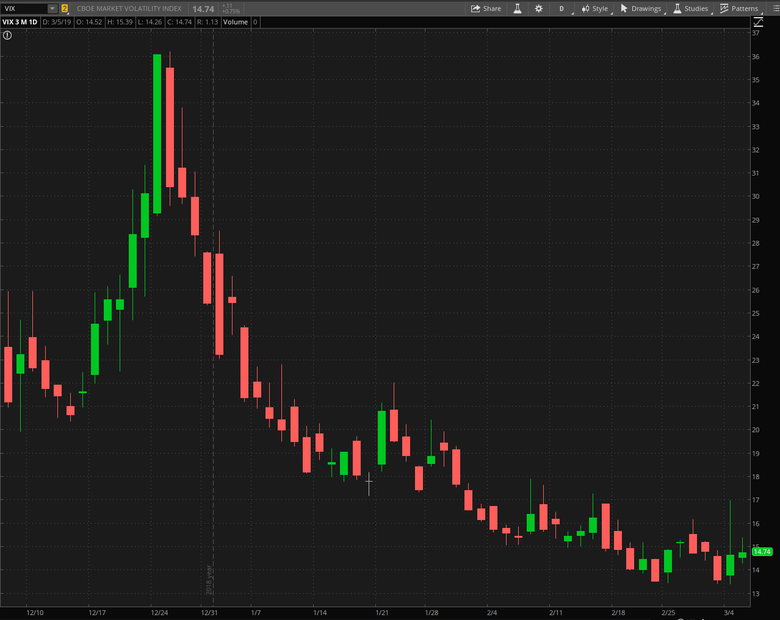 And, it’s worth mentioning again that the VIX has been at levels markedly below what is historically normal. Data Source: Cboe. Chart source: The thinkorswim® platform from TD Ameritrade. For illustrative purposes only. Past performance does not guarantee future results. 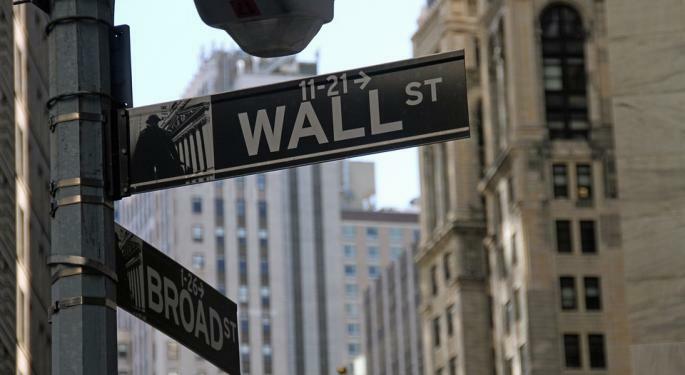 Looking Ahead to Payrolls: Although it remains to be seen whether recent S&P 500 down sessions are forming a top, it is arguable that investors are looking for a catalyst to push the market one way or another. One potential event could be the jobs report later in the week. Nonfarm payrolls for February are expected to show a gain of 173,000, according to a Briefing.com consensus estimate. If we see unexpectedly large gains like we have in recent reports, perhaps that could be a positive catalyst. This time around, it’s arguable that the market might not worry too much about the inflationary potential of such a report (unless there are outsized gains in average hourly earnings) given that inflation indications have been muted enough recently that the Fed has been able to step back into a more dovish stance. Instead, the market might view a better-than-expected jobs report as moving the economy back toward a Goldilocks scenario. Of course, GDP isn’t where it was in the first half of last year, but it’s still nothing to sneeze at. If the jobs report comes in soft, however, the market might react negatively as it would come during a time when we’re also seeing weak economic signals out of China and Europe. A Good Omen? : February was a historically unusual month for stocks. Since World War II, February has tended to be the second-worst performing month on average for S&P 500 stocks behind September, according to investment research firm CFRA. But this year, the benchmark rose 3% in February. What’s more, there have only been 28 times from 1945 through 2017 when the S&P 500 has risen in both January and February, as it has this year. For all of those occurrences, the SPX recorded an average 24% return for the whole year. “With equities on a tear so early in 2019, it should come as no surprise that cyclical sectors and momentum groups have outperformed the overall market,” CFRA noted. Millennials Buy Pot Stocks: Millennial investors make up an important part of the overall investor mix. And for the first time in four months, activity among TD Ameritrade’s millennial clients in equities differed from the total client population, according to February’s Investor Movement Index® (IMXSM), which is TD Ameritrade’s proprietary, behavior-based index that measures what investors actually have been doing and how they have been positioned in the markets. Overall, TD Ameritrade clients were net sellers of equities, but it turns out that millennials were net buyers of stocks. The younger generation bought Apple Inc. (NASDAQ: AAPL) and pot stocks like Aurora Cannabis Inc (NYSE: ACB), Canopy Growth Corp (NYSE: CGC) and Cronos Group Inc (NASDAQ: CRON).